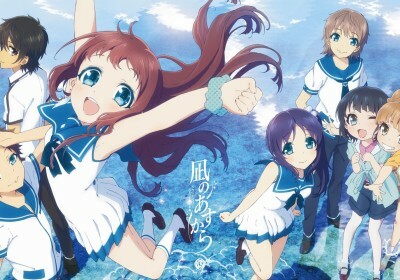 Overview: Nagi No Asukara is an anime about a race of merfolk whose school closing forces them to attend school on the land with human children. Their elders worry about preserving the merfolk culture, heritage, traditions, and are distrusting of the humans. The children are both sad about their school closing, as well as excited to be able to attend school on the land. Humans used to worship the sea god, but lately they have turned their back on the old ways in favor of progress. The anger of the sea god has had implications for human and merfolk alike and it only continues to worsen throughout the series. The children want to help find a way to calm the sea god, and together the merfolk and human children work on an “offering” to please the god of the sea. However, the sea god’s anger is even greater than they could have imagined. The merfolk suggest going into hibernation to sleep until his wrath passes, which saddens the children who realize that their new human friends will be much older and/or deceased by time they wake up. The children agree to take matters into their own hands to find a way to calm the sea. There are some love triangles and a “coming of age” theme and romance built into this series as well. Wikipedia classifies this anime as a Shonen (anime for young boys) But I would not agree with that. I’d classify it as a Shoujo (anime for girls) due to the heavy themes of romance throughout as well as the “cutesy” big head, big eye look of all the characters. There are no battles or fighting, it’s mostly just a slice of life anime. Last I checked, that’s not what Shonen anime is lol. The merfolk are protected by scales (I believe they call it Etna (but could be wrong)) which allow them to breathe underwater and make their skin sparkle like diamonds when in the light. (kinda like Twlight’s take on Vampires). This is their blessing from their sea god. Should a merfolk fall in love with a human, they will instantly lose their scales and be forever unable to return to the sea (as a sign that they have turned their back on the sea god and his people). This becomes a main theme throughout the series; It affects not just the main characters, but side characters as well as the back story. Artwork / Animation: 5/5 I love the cutesy character designs, the simple, calming color palette, the cute school uniforms, and well just everything about this anime screams cute, cute, cute. Story: 10/10 I really enjoyed this story; it takes some twists and turns and it didn’t really end the way I imagined it. It’s not predictable, it’s not very deep or heavy either though. It is very emotional, but it’s a short brief ride with a good mix of romance and suspense. It was sweet and heartfelt and reminded me of a “modern day” “Little Mermaid” with a few twists. Characters: 10/10 The design of the characters alone is just incredibly appealing to me. They are beyond kawaii (cute). I also love watching the characters grow and change so much through this series, as they come to understand their feelings and navigate through various emotional upheavals as they come to odds with humans, merfolks, their elders, or even each other. Voice Acting: 3/5 It was good, not the best voice acting I’ve ever heard, but “good”. Manaka’s voice iritates me, but it fits her character well – she is a sorta airhead and crybaby. It’s cute in it’s own way, but the constant “whiny” quality tends to annoy me. Music: 3/5 It’s been less than a year since I watched this series, and I honestly can’t even remember the opening theme. Where as there are some anime I watched 15-20 years ago and can still hear the theme even now in my head. The music was “fine” but just not memorable to me. Average-ish. Note: Story and Characters are always weighted more heavily than other categories for anime reviews. This being because they are the most important qualities in (my) enjoyment of anime. I can suffer through an anime with bad art or bad voice acting if the story and characters are interesting, so we score them on a scale of 10 points, and the other areas on a total of 5 possible points. In this case, I would’ve given the art 10/10 because it’s just that cute, and the art did in fact effect my enjoyment of the show; but there are shows out there, with ugly as heck art, but a great story. That’s why I always weight story and character higher in the grading scale. I feel most other girls (my target audience) probably also value story and characters more than art/music/technical qualities. Sailor Moon Newbie Recaps: Episodes 112 & 113 – InfoDump? More like InfoAvalanche. Watch This Disney Animator Draw In Virtual Reality. It’s Like Peeking Inside A Cartoon.